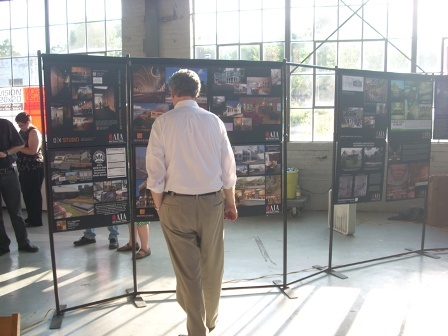 If you missed the Honor Awards Program at the Michigan Theater, you can see all the submitted project boards at the Malletts Creek Branch of the Ann Arbor District Library (3090 E. Eisenhower Parkway Ann Arbor, MI 48108 734-327-4200) - from November 1st through December 15th. AIA Michigan Center for Emerging Professionals and Resources (CEPR) hosted the first Vision 20x20 event at the Liberty Research Annex (a.k.a. 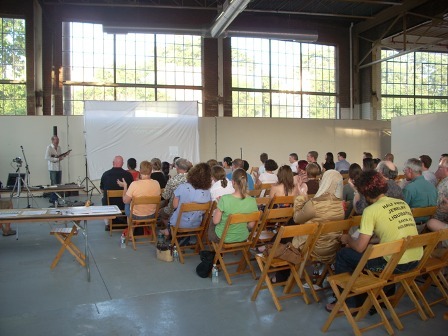 Liberty Loft Glasshouse) during the Art Fair (Thursday, July 21 7.30pm). The theme of the event was Emerging Design for a New Century and ten speakers from creative fields including architecture, graphic design, interior design, landscape architecture and visual arts were given six minutes and twenty slides to present their take on the theme. The opening act, a digital violin performance by Dixon’s Violin, was a perfect antidote to the ninety-nine degree heat spell and drew much interest from passers-by on Liberty Street. 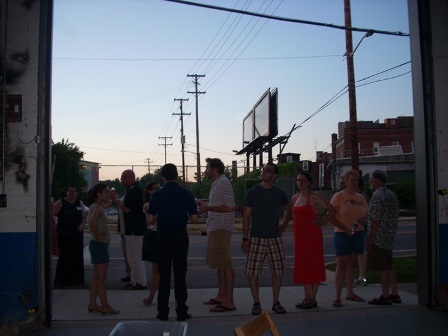 Despite the record temperature, the event was well-attended by a diverse group of attendees consisting of local architects, students and the public. 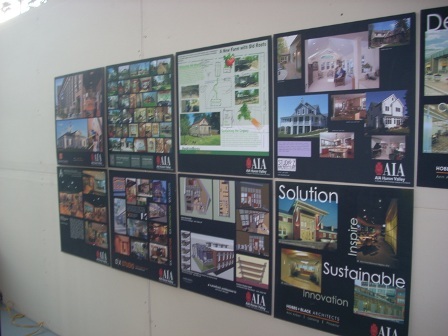 AIA Huron Valley’s Design Award Boards on exhibit also drew plenty of attention. CEPR thanks all of our volunteers and sponsors, in particular AIA Huron Valley volunteers / CEPR leadership (Kristen Schleick, Nicole Eisenmann and Phil Proefrock) and Structural Design Incorporated whose generous sponsorship of the CEPR program made this event and other emerging professional programs possible. If working on a committee is more in line with your interests, volunteers are needed to assist with Continuing Education programs, our Honor Awards traveling display, emerging professional events and planning Archifest 2012. Have an idea - come join in! It is your AIA! The Building Enclosure Council – Greater Detroit (BEC-GD) is pleased to announce the October 18th Symposium theme: Understanding Hygrothermal Performance. Attached you will find information on the Symposium and the renowned speakers along with sponsorship opportunities. Connect with Custom Residential Architects Across the Country Through CRAN! Dawn would like to hear from you if you are interested! CRAN has recently become an independent AIA Knowledge Community. This elevation is the culmination of years of work and will allow us to unite and represent all custom residential architects within the AIA. Further, it opens the door for more custom residential architects to join the AIA. Given the number of non-AIA residential architects, the potential for inclusion is monumental! In fact, during a meeting of all KCs in New Orleans, our growth was heralded as a role model for other KCs to build upon. CRAN was responsible for five courses about residential architecture at this year's convention in New Orleans. CRAN also contributed to several courses developed by the AIA Small Project Practitioners KC. Our steering committee has organized several national events for residential practitioners over the last four years, including symposiums in Minneapolis, Chicago, and Austin. In addition, we have participated in Hanley Wood's annual Reinvention conference. We are currently working on plans for our next annual symposium, which will take place October 13 through 16 in Indianapolis. This event will include a roundtable discussion on the diverse forms of residential practice, featuring incoming AIA 2012 President Jeff Potter, FAIA. Planning has already begun on the 2012 CRAN Symposium in Newport, Rhode Island. Eating hotdogs, marveling at the DIA Rivera mural, Gunnar Birketts underground library, photographing the Detroit River from the top of the Guardian building or paddling on the Huron in Ann Arbor, were just a few of the highlights from the sister city and AIA exchange this June. Longtime AIA Huron Valley Chapter Member Larry Brink passed away peacefully at his home in Pinckney, MI on June 15, 2011. Larry was one of the original members of the Frank Lloyd Wright Building Conservancy and served on its board multiple terms. He was also a Frank Lloyd Wright Fellow and served two terms as president of the Frank Lloyd Wright Fellowship Board and many terms as a board member. Larry, Richard Fry, Richard Black, Jim Meneghini, and Bill Nowycz were all students at the UM in the old A&D building together and had many wonderful train trips to Chicago attending NEOCON meetings including a few restaurants and bars. Good times! YOU'RE INVITED to join the Michigan State University School of Planning, Design, and Construction and Consumers Energy for a one-day seminar on interpretation of the 2011 Michigan energy codes as they apply to commercial and industrial buildings. In addition to the valuable insight into Michigan's newly adopted energy code, you will learn about Consumers Energy incentive program for existing building commissioning and hear about the latest information in net-zero energy (NZE) buildings. Join presenters William Bezdek, P.E. from Michigan State University; Joe Wadel an architecture graduate from the University of Michigan and New Construction Lead; John Nametz an engineer and Smart Buildings Lead from the Consumers Energy Business Solutions team; and Shayne Rolfe of KEMA Sustainable Buildings and Operations, will share the topic of net-zero energy buildings. In addition you will learn about the new codes, building technologies and financial incentives for energy efficiency construction. Cost: $50.00 for this full day of training. This includes a copy of the ASHRAE 90.1 - 2007 code book. Course content is eligible for self reporting Continuing Education Units. Certificate of course completion to all attendees. To register for the event click on the link below. The Detroit Regional Chapter of the USGBC cordially invites you to attend the next networking and tour event being presented by the Detroit Regional Chapter. Please contact the Detroit Regional Chapter if you have any questions, and feel free to invite a friend or interested colleague! The Modernism at Risk initiative is a program created by the WMF with founding sponsor Knoll in 2006 to address the distinct threats facing great works of modern architecture around the world. This program focuses on advocacy, conservation, and public education. Michigan Matters is the Taubman College response to the WMF initiative by bringing to light the modern architectural resources distinct to Michigan and Ann Arbor. The W...MF exhibit consists of large-scale photographs by Andrew Moore, and interpretative panels with five case studies that explore the role designers play in preserving modern landmarks. The five buildings highlighted include the Grosse Pointe Public Library in Grosse Pointe Farms, Michigan – saved from demolition by local residents with partial funding for its renovation from the WMF. The Michigan Matters exhibit materials include reproductions of drawings from the Albert Kahn, Mies van der Rohe, Minoru Yamasaki, and Saarinen Collections. In addition, photographic documentation depicting various modern buildings at varying time periods will be displayed. Cooperation from the Balthazar Korab Studio, Cranbrook Archives, Museum of Modern Art NYC, State Archives, and the Bentley Historical Library have made it possible to exhibit significant works of Michigan modern architecture. Exhibit Opening Reception March 16, 5-7 p.m., 305 W. Liberty St., Ann Arbor.